Soon after leaving Port Lockroy in our wake, we arrive at the famous Lemaire Channel, noted for its narrow confines and spectacular cliffs rising on each side. About six miles long, the LeMaire Channel takes about one hour to navigate (depending on how much ice is in the channel). Conditions were – surprise! – very cloudy for our passage through the strait. It was nevertheless beautiful, with several sections filled with brash ice and small bergs. We did get a partial sense of the heights and dramatic peaks that rise almost vertically from the edges of the narrow strait but we clearly could not see all the walls and peaks the we knew were hanging above us in the mist. I’ll just have to cross my fingers that it is clear and sunny on my next visit, so I can really appreciate the LeMaire Channel. 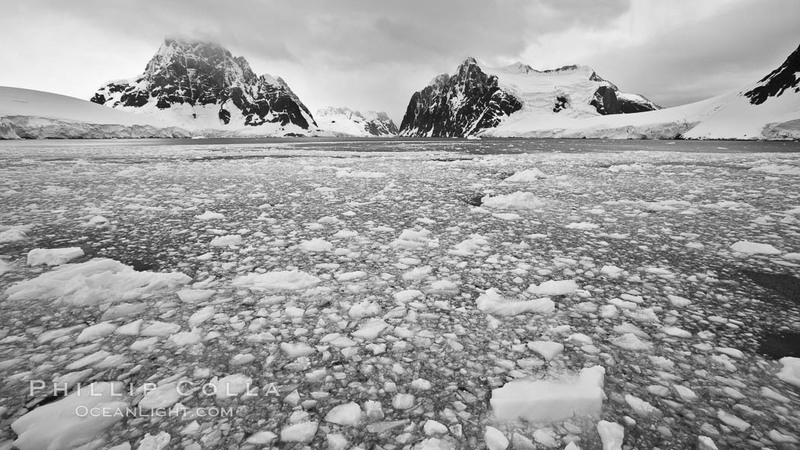 Lemaire Channel: mountains, sea, ice and clouds,Antarctica. The Lemaire Channel, one of the most scenic places on the Antarctic Peninsula, is a straight 11 km long and only 1.6 km wide at its narrowest point.